Dolcetto is generally considered a wine to be drunk quickly, and as a rule this is true: unless the winemaker is maniacal about cleanliness, with time it develops funky aromas and flavors that become progressively stronger as time goes on. This is a blend of Gewurztraminer and Riesling Renano, and is a deep brassy gold with brilliant reflections. The bouquet is powerful and frankly medicinal with mint and eucalyptus mingled with honey. Quite charged and quite particular. On the palate it's quite dry -- unexpected this is -- with bright almost brambly minerality supported by considerable warmth and some citric accents, and flows into a long warm mentholated finish with savory overtones. It was a great surprise, and is a wine some will love and others abhor. Almandine with pale rim. The bouquet is fairly intense with medicinal accents and wet leather supported by some minerality, while swishing brings up pleasant savory leathery accents. One certainly wouldn't guess it is 10 years old. On the palate it's fairly rich with deft minerality and green leather supported by smooth dry tannins and warmth that flow into a clean tannic finish with lasting warmth. Graceful in a rather tannic key, and quite pleasant; it you like older wines you will enjoy it considerably because it has held up very well. Nicoletta didn't make the 02. Deep brick ruby with cherry rim. The bouquet is fairly rich, and mineral with some sweetness and mentholated accents, supported by some sugars and leaf tobacco with alcohol and some spice from the grapes. On the palate it's full, rich, and fairly sweet -- the vintage was very hot and goosed the sugars -- with moderately intense sour berry fruit supported by leathery tannins that are rather dry, and by peppery spice that flow into a long dry tannic finish laced with alcohol. Graceful, and though it clearly came from a hot vintage displays pleasant balance and depth. The 2001 was more elegant and balanced, but this is very nice. Deeper ruby than the older two, with cherry in the rim. The bouquet is fairly fresh -- we're approaching the notes of a younger Dolcetto, though there are also tertiary aspects -- red berry fruit supported by green leather and some leaf tobacco, and also some spice, hints of violets, and savory accents. Nice depth and clearly from a good vintage. On the palate it's bright, with rich cherry fruit supported by lively spice and bitterness, and by some leaf tobacco, with savory notes and rather dry tannins that flow into a clean savory finish. It's much younger than the older wines -- a function of the vintage -- and has a lot to say. A wine to think about if you like the style and are willing to listen. Cherry ruby with reddish rim. The bouquet is dusky, with Moroccan leather and minerality supported by underbrush and some bramble. Not much fruit and it gives an impression of coolness. On the palate it's fairly bright, with leathery, leafy berry fruit supported by dry tannins that have some leafy accents and flow into a rather mineral finish that's fairly dry. Pleasant in a cool weather key, and given the 2005 vintage frankly impressive. Not many Dolcetti from 2005 will be like this today. Lively cherry ruby with violet rim. Bright for an older Dolcetto. The bouquet is fairly rich, with red berry fruit supported by some acidity and brambly spice with an underpinning of underbrush, some wet bark, and a fair amount of alcohol. Powerful. On the palate it's full, with rich ripe sour cherry fruit supported by peppery spice and moderate acidity that flow into a warm decidedly tannic berry fruit finish. We step forward in terms of youth, and the wine is also typical of the vintage in terms of displaying angry greenish aggressive tannins of the sort one finds in a great many 2006 wines. This is the latest vintage, bottled but not released when I tasted it. The bouquet is fairly rich, with red berry fruit and savory notes supported by alcohol and some spice; it's clearly mature and doesn't have the floral accents one will find in a younger Dolcetto, but displays nice depth and balance, and is also quite fresh. On the palate it's full, with rich cherry fruit supported by delicate acidity and by tannins that are fairly dry and flow into a savory finish. It's much readier and much less aggressive than the 06, though this is relative -- it does have the Dolcetto personality and isn't a wine to drink far from the table. Rather, with succulent roasts and stews. This is a Barbera, named after the vineyard. It's brick ruby with almandine in the rim. The bouquet is mature, with red berry fruit supported by leather, leaf tobacco and some spice. On the palate it's quite fresh, with warm sour cherry fruit supported by deft warm berry fruit acidity and by smooth rather light tannins that flow into a warm fairly tart finish. Elegant, displaying considerable grace,a nd will drink quite well with grilled meats fried meats, and light roasts. This is a Nebbiolo; it's pale almandine with orange nail, and has a classic Nebbiolo bouquet with rosa canina and berry fruit supported by cedary accents -- not small wood -- sea salt and bitterness. Quite harmonious and pleasant to sniff. On the palate it's ample and rich, with bright sour cherry fruit shot with warmth and moderate berry fruit acidity, while the tannins, which have a dusky dryness to them, aren't as aggressive as those of the Dolcetti, and flow into a delicate sour cherry fruit fading into dryness. Quite pleasant in a decidedly old style and will drink very well with roasts or stews; it will also age nicely for another 5-10 years. Classic Nebbiolo di Langa, which is a different animal from Barolo and Barbaresco. One of the nicest things about Vinitaly is that some wineries, especially older ones with historic traditions, bring some of their older vintages for visitors to explore. This time Capezzana, whose archives stretch back to the 30s, brought a fascinating set of wines from the more recent past. 70% Sangiovese, 15% Cabernet Sauvignon, 5% Canaiolo and 10% other traditional varietals, aged 24 months in large (25 hl) casks. Brick with orange rim. The bouquet is delicate, with leather and some Moroccan leather acidity supported by underbrush and some medicinal notes, with underlying eucalyptus and leaf tobacco. Graceful in a fully mature key, and has quite a bit to say. On the palate it's it's bright, with fairly rich sour prune fruit supported by deft mineral acidity and some leathery accents, while the tannins are quite smooth and have some leafy accents to them. It's graceful, with considerable bright acidity that has provided backbone and both allowed it to reach this age, and given it good potential for the future. A very enjoyable older vintage. 70% Sangiovese, 15% Cabernet Sauvignon, 5% Canaiolo and 10% other traditional varietals, aged 24 months in large (25 hl) casks. Almandine with orangish rim. The bouquet is fairly rich, with red berry fruit and dried flowers supported by clean berry fruit acidity and savory accents with Moroccan leather from old book bindings. Elegant though not as rich as the 74. On the palate it's quite pleasant in a full mature key, with bright tart berry fruit acidity more than fruit, supported by smooth tannins that are silky and savory, and flow into a long tart finish with some tannic underpinning. Though mature it is still quite fresh, and bright, and is a testament to the importance of acidity in red wines because without said acidity it would have settled. 80% Sangiovese, 15% Cabernet Sauvignon, 5% Canaiolo, aged 12 months in large (23 hl) casks and 12 months in bottle. Deep black almandine with black highlights and almandine rim. The bouquet is elegant, with savory berry fruit supported by balsamic notes and Moroccan leather with some spice. It has quite a bit to say and is quite harmonious. On the palate it's full and rich, with elegant sour cherry fruit supported by bright acidity and tannins that are velvety though they do have steely accents, and flow into a clean bright finish with considerable peppery acidity. Quite pleasant, and unlike the older wines, which I would only drink far from the table, will go well with a steak. 80% Sangiovese, 20% Cabernet Sauvignon, aged 12 months in 350 liter tonneaux and 12 months in bottle. Beginning with Stefano Chioccioli's arrival in 1998, Capezzana carried out green harvests in all their vineyards, thus increasing the quality of their grapes to the point that there was little point in making both Carmignano and Carmignano Riserva. Deep brick ruby with some almandine in the rim. The bouquet is muted; swishing brings up some berry fruit and spice supported by sea salt, some sour berry fruit acidity, and slight leather, with underlying dried flowers. On the palate it's ample, with fairly rich sour cherry fruit supported by berry fruit acidity and tannins that have a warm burr and flow into a long warm finish. By comparison with the older vintages is suffers some and this is because the end of the summer was excruciatingly hot in Tuscany, hot enough that it interfered with ripening. 80% Sangiovese, 20% Cabernet Sauvignon, aged 12 months in 350 liter tonneaux and 12 months in bottle. Deep cherry ruby with cherry rim. The bouquet is fairly rich, with savory notes and red berry fruit supported by a fair amount of alcohol and considerable austerity -- it really isn't at all happy about being on display in the glass. On the palate it's ample and smooth with fairly rich red berry fruit supported by deft acidity and smooth tannins that flow into a fairly long spicy tannic finish. It's quite elegant but simply NOT ready, and needs time. If you have the patience to give it, it will reward you, and the score reflects the present. 80% Sangiovese, 20% Cabernet Sauvignon, aged 12 months in 350 liter tonneaux and 12 months in bottle. Bright cherry ruby with cherry ruby rim. The bouquet is brighter and readier than that of the 06, and also fresher, which makes sense since it's a year younger; there are red berry fruit and underbrush mingled with vegetal accents and fairly bright acidity, with some underlying goudron. On the palate it's full and rich with powerful red berry fruit supported by smooth tannins that do display a slight burr and flow into a long warm fairly bitter finish. It's quite approachable, and at present superior to the 2006 (though its older sibling may pull ahead with time). Quite pleasant, a wine you will set out and drink, and though one usually doesn't say this about wines of this caliber, it applies here. This year Radici began with two days during which the wine makers poured their wines for us. A very interesting experience, which left me with a great many notes that I am now working through. Colle San Domenico was established in 1998 in Chiusano San Domenico (province of Aellino), in the heart of Irpinia. They have 15 hectares of vineyards planted to both red and white varietals, and though most of the vineyards are 10-15 years old, the vineyard that yields Aglucus Campi Taurasini DOC is on native root stock and much older. This underwent cryomaceration prior to fermentation, and is pale brassy yellow, with a fairly rich bouquet opening with citric spice and some loquat supported by slight banana, which is derived from the yeasts, and underlying minerality. On the palate it's bright, with loquat pineapple fruit supported by bright acidity that has tropical fruit overtones, and slight tannins (from grape) that have a slight greenish burr. Quite pleasant and will drink very well with fish or white meats. This is from a vineyard at an altitude of 600 meters. Brassy white with greenish reflections. The bouquet is fairly rich, with hops and savory notes mingled with citrus and supported by savory minerality that brings freshly crushed granite to mind. On the palate it's pleasant and quite savory, with bright citric acidity that flows into a long savory finish. Graceful,a nd will be quite nice with egg-based dishes, for example quiche. Aglucus is, I was told, the Greek name for Aglianico, and indicates without sugar, i.e. bitter -- a vine yielding wines with tannins that would age. The wine is from an old vineyard planted on native root stock that that doesn't yield wines in all years. It was aged for a year in casks, and then 3 months in small wood, and is unfiltered. It's elegant ruby, and has a powerful bouquet with bright berry fruit supported by balsamic notes, mint, spice, and some chocolate-laced cedar. Young. On the palate it's graceful, though still out of sorts, with sour balsam-laced berry fruit supported by balsamic tannins that I found a touch dry, and flow into a long savory finish. It is drinkable, and will indeed work well with roasts, but will also improve markedly with time. This ages for three years in a mixture of small, medium, and large casks, then a year on the lees in steel, and a year in bottle. It's deep cherry ruby and has a spicy bouquet with berry fruit and balsamic notes mingled with menthol and savory accents; it's more powerful than the Aglucus but displays less finesse. On the palate it's full, and rather linear, with smooth sour berry fruit supported by savory notes and some acidity, with smooth tannins that have some balsamic cedar accents. Nice depth and elegance, and a good expression of a wetter vintage that will work well with hearty red meats. My wife and I live a few kilometers from Rome, in a neighborhood that was considerably quieter a few years ago, where the air was clean and in the evenings we could enjoy dinner outside in the yard. Things have changed surprisingly fast; the population has doubled, as has the number of houses, while there is much less green, the views have lost much of their beauty, and the air is no longer that different from Rome's. Noise, artificial light, traffic, and smog. Every now and again we thus feel the need to get away from it all, to find places to our measure, and they are ever further away. This time we had an excuse to get away: To see Piero Della Francesca's Madonna del Parto at Monterchi, in the Province of Arezzo, a trip we had put off several times, knowing full well that we were missing something great in doing so. On September 10 we set out with a strange feeling of euphoria, the same we felt as kids when our parents took us on vacation. 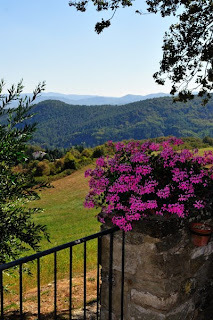 As is my well established habit, before going I looked for a place to dine at our destination, and recalled that near Anghiari there's an inn where one can also sleep, surrounded by the haunting panoramas of the Riserva Naturale dei Monti Rognosi. 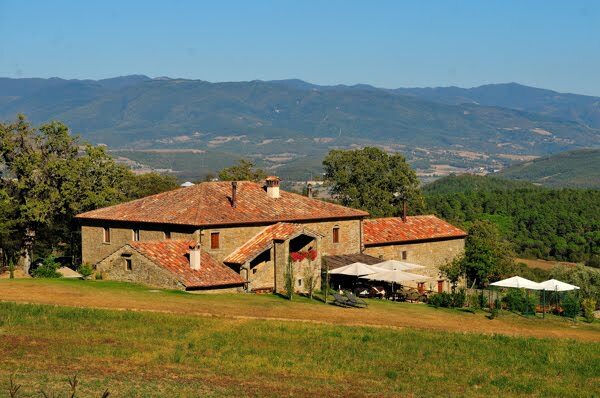 The Locanda del Viandante is located in Cerreto, just outside the beautiful town of Ponte alla Piera, about 10 km from Anghiari. The first thing we noted was the silence, a peace we were no longer used to; even the birds and the cattle in the nearby meadows seemed bent on respecting it. We were greeted by Martha, who serves at the tables, all outside because it was a beautiful day, warm but with nice breezes. "We work with local, no-carbon-footprint ingredients, and all it takes is a look around to see we lack for nothing -- things from the vegetable patch, meats, cheeses, cold cuts, and water from a nearby spring. Everything from unspoilt countryside, that's our philosophy," she said. "In the kitchen are Fiorella and Daniela, who make pasta completely by hand, without the aid of any machines, using simple ingredients to make local dishes following tradition and the seasons." Just what we were looking for, before going to enjoy Piero della Francesca's masterpiece in nearby Monterchi. We were unable to resist Panzanella, crudité in pinzimonio e fettunta con olio extravergine IGP Toscano Bio, an absolute treat, a dish both disarmingly simple and stratospherically good. Laura and I then took different paths: she opted for Ravioli di erbe al ragù di Chianina, while immersed myself in Bringoli al pesto di aromi della Locanda (bringoli are made with water and flour, and are a specialty of Anghiari). Mine was excellent, but I'd have liked a drop less oil (as you can see in the picture), whereas the ravioli were perfect, very tasty, and made with excellent meat. The second course couldn't be but meat-based; we opted for Tagliata di Chianina accompanied by first-rate baked potatoes for me, and a delicious seasonal vegetables sformato for her. Perfectly cooked, with just enough blood to make it succulent. Though we were already full, we decided to share Vanilla Ice Cream, served in bowls with brushings of melted dark chocolate, and we weren't at all sorry because we could taste the quality of the ingredients, with sweetness that was not excessive and vanilla without the contrived aromas one often encounters in even the best gelaterie. The wine list is adequate, with about 50 wines, mostly local, with a few from Chianti and Montalcino, etc; we selected (primarily with the splendid Chianina in mind) La Pelvaccia's Origine Nero 2006, a Sangiovese that was very nice, silky thanks to the roundness that came from barrique aging, but enough acidity and enticing licorice notes supporting a fruity, spicy weave. The Agriturismo has 5 large, airy rooms that are sparingly but well furnished, and it goes without saying that the views were beautiful. Prices? Our lunch cost 75 Euros, including water and coffee. The rooms are offered following the B&B formula, i.e. night and breakfast, and run 60-80 Euros for the doubles and 90-110 for the triples. Hikers will be in ecstasy because the Locanda del Viandante (my note; Viandante means wayfarer) organizes treks in the surrounding mountains (an extremely popular one, which departs from directly in front of the Locanda, is called "Following the wolf's tracks"). 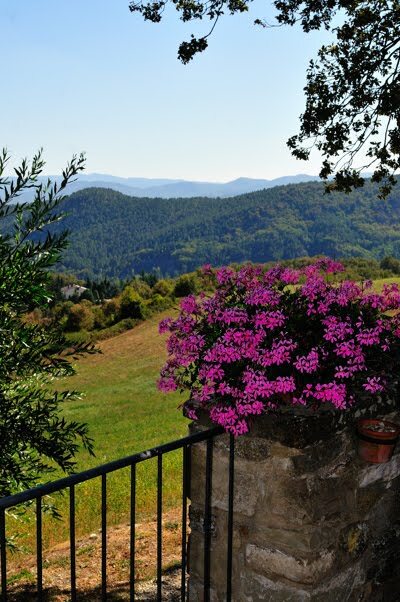 The nearby hamlet of Ponte alla Piera and the beautiful town of Anghiari are also well worth visiting. 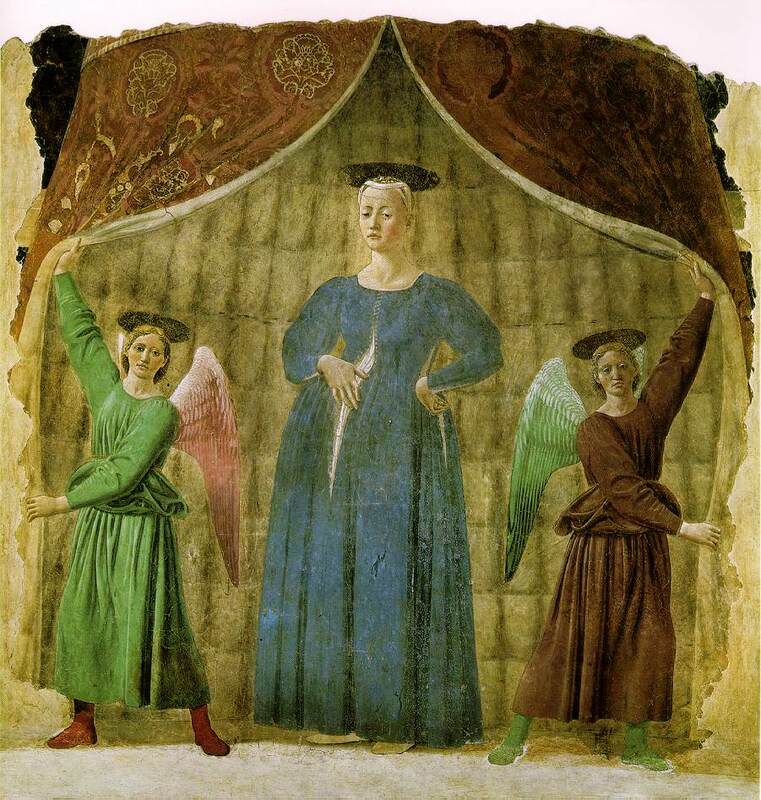 And once you're there, you cannot miss the Museum of Monterchi, where you'll find Piero della Francesca's Madonna del Parto, a fresco of rare beauty that is striking both because of the subject and the symmetries, emphasized by the angels who flank the Virgin and hold up the flaps of the tent. If you haven't seen it, you must. Wine making regions tend to be pretty, and Franciacorta is prettier than most; it's at the mouth of Lago D'Iseo, an alpine finger lake at the foot of the Val Camonica that would likely drain away into the Pianura Padana were it not for several imposing crescent-shaped end moraines whose height and breadth give a good idea of just how large the ancient Alpine glaciers were. Within this panorama the Bersi Serlini family, which began making wines in 1886, has been quite fortunate. They are located in the Commune of Provaglio d'Iseo, a short distance from the Monastery of San Pietro in Lamosa (the land once belonged to the monks, who hosted travelers where the winery now stands). 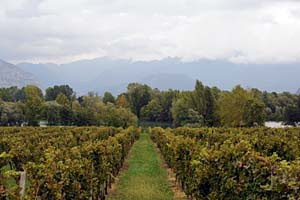 They have 34 hectares of vineyards that extend down to the lakefront, and while one might wonder at having vineyards along a shore line the effects are quite beneficial; the vineyards are laid out with rows perpendicular to the shore, and during the summer receive the cool nighttime breezes flowing down the Val Camonica, which eliminate the moisture that could cause mold or rot; Maddalena Bersi Serlini notes that because of these breezes they can limit treatments to just copper and sulfur in about half their vineyards. The harvest in Franciacorta is timed differently than in most other appellations because good acidity levels are of paramount importance for making good sparkling wines. Since acidity decreases with increasing ripeness Franciacorta producers harvest at the beginning of August, and Maddalena says she is always one of the first, as a result her neighbors call her Lumicino, or signal light -- when they see her pickers in the vineyards they know it's time to get ready. Once the grapes are picked they are soft-pressed and the resultant must descends by gravity feed into the tank hall, where the cellar masters keep it in steel holding tanks briefly, while cooling it, and then transfer it to fermentation tanks. Fermentation is by vineyard; since they are by now quite familiar with their vineyards they have tanks of the proper size for each vineyard. Almost all of their wine ferments in steel, though they do barrel ferment small amounts of wine for their top wines -- about 5% for the two Franciacorta Riserva wines, using year-old barrels purchased from a winemaker who ferments his white in new oak. The varietal makeup in the vineyards is, as one might expect given Franciacorta, largely Chardonnay, though they do have a little Pinot Bianco and Pinot Nero, in hillside vineyards. It is all fermented in white, and this brings up an important point. With the exception of a little red wine they make for local consumption, everything they make is white, and it all sparkles. 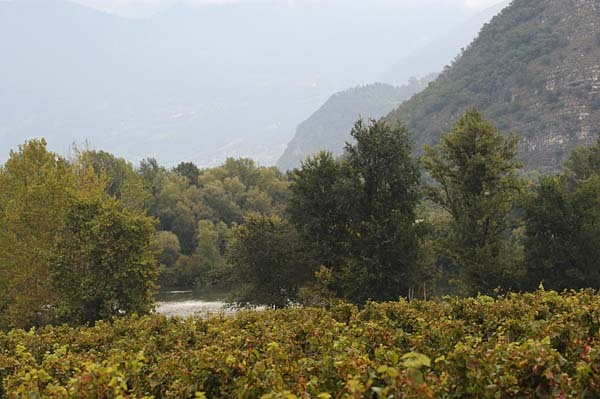 "I decided, since we're in Franciacorta, that we should concentrate on Franciacorta," Maddalena says, adding that when she made the decision some of the sales reps, who were used to having Bersi Serlini their still wines too, objected. To be honest, I think she made the correct decision, and expect that they have come around. This is Non Vintage, Chardonnay and Pinot Bianco that ages on lees for 21 months, and the vineyards are 15-20 years old. Maddalena says it's their traditional wine, first produced in 1970. Pale greenish straw with fine persistent perlage. The bouquet is pleasant, with gunflint and heather supported by some sea salt and wet bread crumbs; pleasant to sniff. On the palate it's bright, with lively savory citric fruit supported by sparkle and some vegetal notes, and also the sour yeastiness of the lees; nice balance and quite approachable, and will drink quite well with foods, from elegant risotti through fish based pasta sauces, and also fish in general, including lake fish. It is eminently approachable, ripe but not too ripe, with acidity that keeps it on its toes. Expect it to go quickly. This is a distinct from the Basic Brut, with a different label, and Maddalena calls it Dedicato, or Dedicated, in that it is a wine bottled for a special event or occasion, in this case Franciacorta's 50th anniversary. They decided to mark the even with a special edition of their Brut -- 100% Chardonnay that spends more time on the lees -- as it is their best selling wine, with a label that reflects their older labels, which were all Liberty. 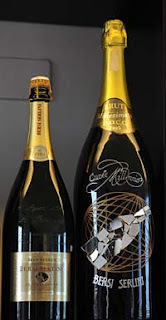 Production is 50,000 bottles, and they view it as an important success, and a reflection of the fact that they believed in and have concentrated exclusively on Franciacorta. The wine is delicate straw yellow with fine perlage. The bouquet is elegant, with rich savory gunflint supported by some vegetal accents and clean fresh bread crumbs; and brings to mind hammer-struck granite. On the palate it's full, rich, and creamy, with deft mineral laced sour lemon fruit supported by creamy sparkle and fairly pronounced underlying bitterness that carries at length into the finish, Quite elegant, and is a wine that will work well with foods, though to be quite honest I would rather sip it as an aperitif, or with friends while talking far from the table, lest the food distract. This is from their four oldest vineyards, all Chardonnay, and a small percentage is fermented in wood. Rest in steel. They consider it to be their most representative wine, and make it in all formats. Since it is a vintage wine it rests longer on lees. Pale straw yellow with greenish reflections and fine intense perlage. The bouquet is deft, with considerable gunflint laced minerality supported by slight hints of citrus and breadcrumbs with slight vanilla accents as well; quite elegant. On the palate it's full and rich, with clean soft sour lemon fruit supported by sparkle and gunflint laced bitterness with an underpinning of butterscotch and some wet bread crumb yeasty accents, which flow into a clean savory finish with lasting gunflint bitterness. Pleasant, and quite welcoming, displaying pleasing deftness and grace; it's a wine that will work with foods, though like the Dedicated Brut it's perhaps better suited to being sipped with friends far from the table. It's the sort of wine one can hold a conversation with. Lot 0210 S; it's Non Vintage. Pale slightly greenish brassy yellow with fine steady perlage. The bouquet is delicate, with herbal notes and gunflint mingled with some sea salt and heather. Quite welcoming. On the palate it's ample, approachable, and soft, with moderately intense savory sour lemon fruit supported by sparkle that's not as creamy as the Cuvee 4° though one really cannot expect that, it has a little more backbone and the vegetal accents emerge a little more strongly, making it better suited to accompanying foods; it will be quite versatile at table and go very fast. Easy to drink (though not simple; if you want there is much to think about) and expect people to want more. They started making this in 1971, when the only thing one could call it was Extra Brut, and they have kept the name rather than adopt Pas Dosé or Dosage Zero -- they consider it to be their heart & soul, because they don't think Franciacorta requires liqueur or sugars. Well kept vineyards, and that's enough, says Maddalena, adding that of her wines it's what comes closes to what she looks for in Franciacorta . Deeper gold with slight greenish reflections and fine persistent perlage. The bouquet is elegant, with rich green sour lemon supported by savory accents and bread crumbs, and by some gunflint as well. Quite elegant and very enjoyable. On the palate it's deft, with rich sour lemon fruit that has some greenish accents and is supported by sparkle and savory minerality supported by some mineral bitterness that flows into a long bitter finish with slight peppery accents from the sparkle. Quite pleasant, and will drink very well as an aperitif; one could also press it into service with foods but it doesn't need the distraction. A friend occasionally says wines are "lovely," and I think he would say so here. This is a vineyard wine, from their oldest vineyard -- 46 years old -- and is a Chardonnay, and spent 7 years on lees. It's pale straw gold with slight greenish highlights, and has fine intense perlage. The bouquet is powerful, with gunflint and hammer-struck granite mingled with bitterness and bread crumbs, and with some smoky accents and slight sour lemon. Nice balance and enticing; it has quite a bit to say. On the palate it's full and creamy, with fullness coming from both bitter minerality and fine sparkle, and flows into a clean rather bitter finish. It's quick to write but quite impressive, with minerality playing very well with sparkle and the acidity, which -- thanks to harvesting at the proper time -- is quite sufficient to hold its own despite the heat of the 2003 summer. A delightful sipping wine, and beautiful minerality. Salmon with some onionskin in the rime, and fine perlage. 30% pn, 24 months on lees. The bouquet is deft, with savory minerality mingled with some gunflint and sea salt, and slight wet bread crumbs. Pleasant in a savory zesty key. On the palate it's bright, with lively minerality and sour berry fruit laced with barest hints of raspberry and supported by mineral acidity and sparkle that flow into a clean rather mineral finish with some peppery notes from the sparkle. It's quite approachable in a fairly muscular, powerful key, and will drink very well with foods; and because it has a bit more body and fullness, will also work well with delicate white meats, for example Spiedo Bresciano, the slow-cooked spitted birds traditionally enjoyed for the winter holidays in Brescia, Expect it to go quickly, and it is versatile too. This is their Demisec, which they have been making for a while -- since 1980. Few wineries make it, but it gives an opportunity to those who want to finish the meal with something less dry. Chardonnay and Pb, on lees for 21 months, and 20-25 g liter of sugar that makes it more balanced. It's pale straw yellow with greenish reflections and fine perlage. The bouquet is fairly rich, with some bread crumbs and slight yellow fruit mingled with citric accents and some gunflint; it has nice depth and there are hints of sugar though it's not obviously sweet. On the palate it's elegant, with deft citric accents mingled with gunflint minerality and sweetness that adds body and fullness, and complements the sparkle, flowing into a clean sweet gunflint laced finish that in some ways brings sweet licorice root tio mind -- there's a lot to say, and it is enjoyable and the licorice in the finish carries at length. A fine wine for after a meal, or perhaps with cheeses. Very pleasant. An Alternative dessert made with this Demi Sec by clubs in Cesena, a coastal area of Romagna also known for its fruit trees: Slice very ripe peaches cut use the slices to line a balloon glass. Let them rest in the glass for an hour, then add Demi Sec and serve. As we closed Maddalena said she is much more interested in acidity than alcohol, and firmly believes in low sugar levels for her bubbly. I certainly can't object. I have known Bruna Ferro for a number of years -- in 2003 I was one of the journalists assigned to visit her at Carussin during Barbera Meeting. Her husband Luigi and I sweated through the vineyards on a vintage jeep, and when we got back to the winery discovered it was well over 100 F -- late in the afternoon, and (if I remember right) not yet June. Following our meeting I made a point of visiting her every year at Vinitaly, and was rather upset to discover she wasn't present this year. 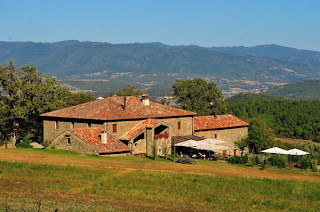 But she wasn't far: She was in the Vicentino, at Vin nature, a presentation of natural wines held in an elegant villa in the Vicentino, Unfortunately, it was hot enough that the shuttle bus from Veronafiere was excruciating. So upon arriving, after downing a bottle of water I went looking for a beer, and that led me to Bruna, because her son makes several top quality craft beers. 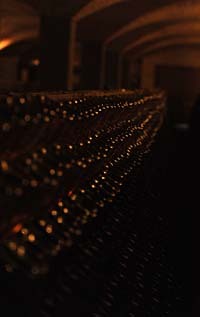 After slaking my thirst I turned to the wines, preferring to concentrate upon wines in bottle rather than cask samples. Deep black cherry ruby with cherry rim. The bouquet is vinous, with jammy notes and some greenish accents supported by heather, spice and moderate acidity. On the palate it's pleasant, with deft sour cherry fruit supported by bright savory acidity and sea salt, while there is also moderately intense more mineral than fruit derived acidity that flows into a clean fresh sour cherry finish with some brandied accents. It feels like it was from a hot vintage, and will drink well with roasts or grilled meats. This is named after Bruna's father, and ages in a 70-30 mix of barriques and botti. It's deep black cherry ruby with ruby rim, and has a fairly intense bouquet with jammy berry fruit supported by bramble and cedar, and some greenish vegetal accents. Pleasant in a concentrated, well oaked key; it gives an impression of substantiality. On the palate it's full and polished with almost dusky berry fruit supported by cleans sour cherry acidity and tannins that have a warm cedar-laced burr and flow into a clean cedar-laced finish. Pleasant in a rich rather dusky brooding key, and will drink well with grilled meats or roasts. Ponderous. Another barrel sample; it's deep violet with violet rim and has a fresh bouquet with red berry fruit and some violets. On the palate it's bright with fairly rich berry fruit supported by moderate berry fruit acidity and savory notes, which flow into a clean tart berry fruit finish. Another wine to drink by the bucket, but not as brash or as tart as Lia Vì. If you like light wines with a little more polish you will like it very much. Nobody who writes about wines expected to do so. 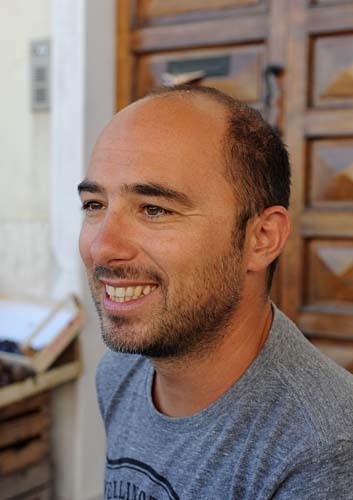 Filippo Bartolotta finished college and after a time applied for a job in management at Vinopolis, a then new venture dedicated to wine in Bankside, a part of London that was then rather run down, but resurging. "Don't have one," came the reply, but they did ask him if he wanted to take a post as a Sommelier. "No," he said, thinking that pouring wines for a living would be a tremendous failure, and continued to look for a job in management while staying at a friend's. When his savings were gone he went back and was told they could take him part time. The people who launched Vinopolis expected an initial clientele of at least 1400 people per day. The actual number was closer to 40, but the 30 sommeliers from all over the world working the floor still had to open the bottles, and took advantage of the opportunity to taste and talk about the wines too; Filippo quickly got a much broader and more nuanced view of wine than he would have had he started to pour in Italy, and his conversations with the clients he served broadened his outlook even further. The break came when Stephen Spurrier saw him tasting a wine he was pouring for a vertical, and asked him to taste with Decanter's tasting panels. After a time they asked him to write about how Barolo ages, a request that led to a trip to Piemonte and an anxiously written first article, and soon he was writing for Decanter, and also organizing corporate wine events. And very much attached to living in London. However, he was in contact with Natalia Greggi, who was putting together a wine tour company called Le Baccanti; she asked him to do a wine tour and course in 1999, and he ended up helping her develop the packages to offer clients. They didn't agree on business strategy however, and he stayed in London, sending people her way. Fast forward to 2002, when he returned to Italy; on the one hand he continued to w rite about wine, for Italian publications too, and on the other Natalia asked him to become a partner. Things worked out differently: his wife Vanessa became pregnant and lost her job as an agronomist. She redesigned Le Baccanti's website to refine its focus, and together they decided to take the company over and make it into a travel agency. And are still there, but it's not that simple. They initially aimed at the British market, but the Web knows no borders and their first important client was an American bent on a family reunion; Filippo offered the party (about 30) the sorts of wine and cultural activities he offered his British corporate clients and the Americans had a great time. More came, and soon Le Baccanti was focusing on the places Americans wanted to go -- Rome and the Alban Hills, Venice, Amalfi, the Riviera Ligure, Milano, the Lake district, and so on, and also organizing second trips for repeat customers, taking, for example, people they had already shown Chianti to to hunt white truffles (and discover harpsichord makers) in Piemonte's Langhe. Then 2008 rolled around, and the phones went dead. "I had a down payment for a trip from a banker," he recalls, "and his phone stopped working. We didn't know what to do." He did have people's email addresses, however, and decided to reverse directions, setting up a package called "Italy at Your Table" and offering it to his clients. They bit, and he soon had 30 appointments all across the US, at which he poured fine wines of the sorts people in smaller American towns simply cannot find, served quality Italian foodstuffs, and made contact after contact, finding himself one day in the White House, discussing how to promote nutrition with the White House Chefs. "It was a round table, and I was the Italian," he says, adding that in the US Italy and the Mediterranean diet, with its combination of grains, proteins, and greens, is seen by some as a model for nutrition. "In Italy we don't realize what we have." What does he like most about what he does? People's curiosity and eagerness to learn. It's not automatic of course; the curiosity of the client must be met by an eagerness to communicate on the part of the producer or cook. "We're in the business of building memories people will share with their grandchildren," he says. In short, Carmignano is unique with respect to the other Central Tuscan appellations, especially now that those in Chianti are turning away from the international varietals that were all the rage 10-15 years ago, and as such it offers a pleasant change of pace. For a considerably more detailed discussion of the appellation, see my introduction to the 2009 presentation. 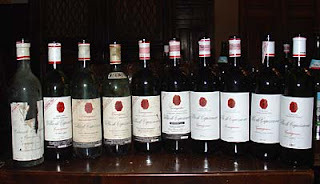 This year's presentation was held at Capezzana, which is by far the most important estate in the Carmignano appellation. Before the tasting began Vittorio Contini Bonacossi spoke briefly about the 2011 vintage, saying that it began quite wet, with the abundant moisture quite sufficient to see the vines through the two dry months that followed. Things were looking very good, with just the right amount of beautiful grapes, until August 19-20, when a hot air mass settled in, raising temperatures in the vineyards to 43 degrees C (about 110 F); the grapes most exposed to the afternoon sun were burned. Those shaded from the afternoon sun (40-50% of the total) escaped damage, though they are extremely concentrated with high sugar contents. Harvesting will be difficult, but should yield a much smaller than usual volume of rather powerful, concentrated wines. In short, what survived, he thinks, will be good to very good, though, I would venture, rather extreme. Vittorio said that the heat will result in severe problems with both Barco Reale, Carmignano's lighter easy to drink red wine, and Vin Ruspo, the appellation's rosé, and there will be estates that produce neither. I began with Carmignano DOCG, and then tasted the Riserva and IGT wines, backtracking thereafter to taste the Vin Ruspo and Barco Reale. The wines are in the order in which I tasted the Carmignano. Villa il Poggiolo Villa il Poggiolo Vin Ruspo DOC 2010 Deep salmon with brilliant apricot and electric pink reflections. The bouquet is moderately intense, with raspberry fruit supported by berry fruit acidity and some greenish accents with pleasing underlying minerality. On the palate it's bright, with lively sour berry fruit supported by brambly accents and acidity, and by slight tannins that do have a greenish burr to them. Brash, and will work well as a cookout wine, and also with fried foods. Nice acidity and a wine that is quick on its toes. Villa il Poggiolo Barco Reale di Carmignano DOC 2008 Deep black cherry ruby with black reflections and cherry rim. The bouquet is fairly rich, with jammy almost cooked cherry plum fruit that gives an impression of considerable ripeness, and a fair amount of alcohol as well, combined with some vegetal accents. On the palate it's fairly rich, with cherry fruit supported by brambly vegetal notes and some savory spice. Direct, and I'd have liked a little more acidity to accompany the fruit. Brick ruby with cherry rim. The bouquet is fairly bright, with lively berry fruit supported by heather and herbal notes, and some menthol, with slight graphite as well. On the palate it's bright, with lively cherry fruit supported by fairly brisk acidity and tannins that have a slight youthful burr and flow into a fairly long berry fruit finish with some hints of hazelnut. Pleasant, though it is unfinished, with the tannic brashness one often finds in barrel samples, and will work well with simple stews or roasts. Villa il Poggiolo Villa il Poggiolo Carmignano DOCG 2009 Deep black cherry ruby with black reflections and cherry rim. The bouquet is unusual, with sour cherry strawberry fruit that is almost candied and has some sandalwood accents, bringing to mind a Moscato di Scanzo. Quite unusual. On the palate it's ample and quite smooth, with some sweetness as well, and ripe berry fruit that again has some sandalwood spice and brings the Moscato to mind, and flows into a graphite-laced bitter finish. Absolutely atypical of Carmignano, but if you like this sort of spicy cast and the richness sweetness brings it will work well with very flavorful stews. Villa Il Poggiolo Villa il Poggiolo Carmignano DOCG 2008 Deep black almandine with black reflections. The bouquet is fairly rich, with cherry fruit supported by jammy notes, greenish accents bell pepper, menthol, sea salt, and graphite shavings. On the palate it's ample and savory with vegetal-laced berry fruit supported by moderate savory mineral acidity and tannins that burr with a cedary underpinning and flows into a savory cherry finish with some underlying bitterness. Villa il Poggiolo Carmignano Riserva DOCG 2008 Deep black cherry ruby. The bouquet is intense, and unusual; it smells of chinotto, which is not quinine as one might expect (though the bitterness is there) but rather a small bitter citrus fruit that grown in Liguria and other parts of Italy, and used to make one of the classic Italian soft drinks -- called Chinotto. Atypical. On the palate it's again odd, tasting of quinine and cedary bitterness; it's not what one expects of a Carmignano. A note: This winery's wines are quite uneven, and this is because they are making a determined effort to improve, and the wines reflect this. I rather like the course they are embarking upon, and will be very curious to see how things progress over future vintages in which the new winemaker oversees production from start to finish. 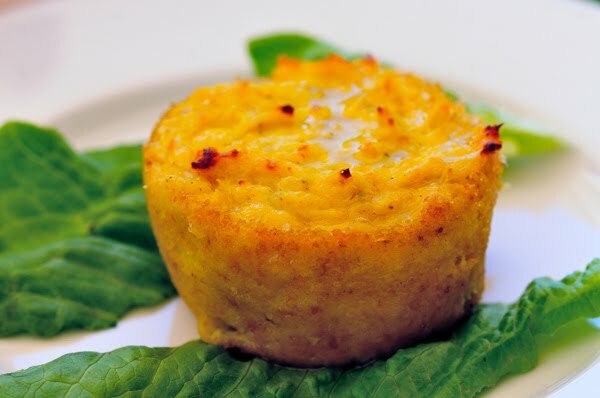 Pale salmon with onionskin rim. The bouquet is moderately intense, with brambly raspberry fruit and hints of licorice root, and also some spice. Nice balance and depth, and quite fresh. On the palate it's bright, with lively brambly berry fruit supported by brambly acidity and tannins that have a slight burr, and flow into a clean fresh brambly finish. Quite pleasant, a wine that will work very well with foods at a cookout or during the summer months when things are best served cool, and will also be a nice aperitif. With respect to the other two Vin Ruspos presented this year it shows greater finesse and is a bit less aggressive, making it more something one could drink by the glass. Tenuta di Capezzana Barco Reale di Carmignano DOC 2009 Deep black cherry ruby with black reflections and cherry rim. The bouquet is fresh, and ripe, with jammy plum cherry fruit laced with greenish vegetal accents and spice, and also with some savory notes and alcohol. Nice balance in a young lively key. On the palate it's bright, with sour cherry fruit supported by graphite shaving bitterness and sour berry fruit acidity, and by tannins that are rather splintery and flow into a bright sour berry fruit finish. 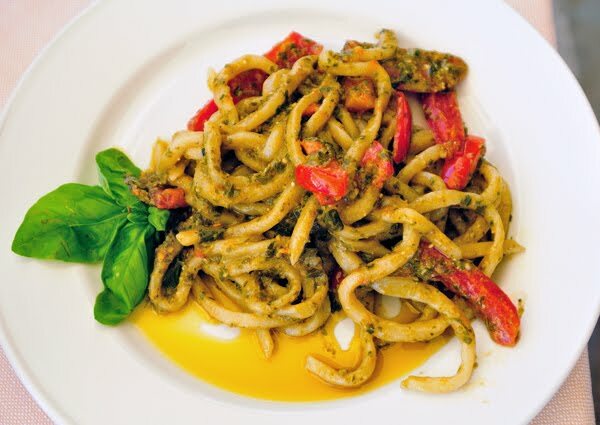 It's lively, and rather aggressive, and will work well with fattier grilled meats or hearty pasta sauces, and also with fried meats and vegetables. Expect it to go quickly if you like the style, which is fairly aggressive. Deep cherry ruby with cherry rim. The bouquet is young and fresh, with brambly berry fruit supported by heather and vegetal accents, and by slight hints of sweetness that add a cheeky brightness to it. On the palate it's bright, with lively cherry fruit supported by tannins that are fresh and smooth, with slight hints of cedar, and flow into a clean bright berry fruit finish that's fairly long. Graceful in a willowy sort of way, and will be elegant as it ages. Very nice for a barrel sample, and will I expect be worth seeking out. Deep black cherry ruby, close to poured ink in its darkness. The bouquet is moderately intense, with cherry fruit supported by graphite shavings and some vegetal accents, with cool alcohol that brings to mind dappled shade, and some spice as well. On the palate it's fairly rich, with bitter minerality more than fruit carrying it, supported by tannins that have a graphite overlay and flow into a rather bitter tannic finish. It's pleasant though not in a really fruit driven key -- more underbrush and vegetal notes -- and if you like this style will work quite well with succulent meats, off the grill or form the oven. If you prefer smoother, fruitier wines it won't work for you. Deep black cherry ruby with black reflections and cherry rim. The bouquet is muted, though swishing brings up some gum Arabic and slight graphite. Not much fruit, though with more swishing savory notes reminiscent of bouillon emerge; it feels very behind. On the palate it's ample and rather bitter, with more savor than fruit, and with dry savory tannins that flow into a bitter savory tannic finish. It's very behind, and in what is sometimes called a "stupid phase," in which it pulls into itself. It needs time to work through it and a score at present will probably not reflect the future. Tenuta Capezzana Ghiaie della Furba IGT Toscana 2007 Deep black cherry ruby with black reflections and cherry rim. The bouquet is fairly intense, and decidedly vegetal, with some cedar as well and hints of vanilla. It's coming together, but there isn't as much fruit as I'd have hoped. On the palate it's medium bodied, with moderately intense red berry fruit supported by some savory notes and sour berry fruit acidity, while the tannins are fairly smooth and flow into a clean savory finish. Pleasant, though it needs a year or two at least. This is a very special wine, a Merlot in Purezza prepared to celebrate Count Ugo and Lisa Contini Bonacossi's 60th wedding anniversary. 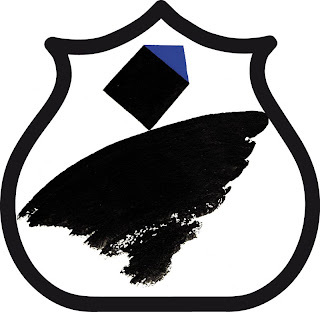 Impenetrable pyrope with a rich nose laced with forest berry fruit and some graphite, alcohol, and underlying pencil shavings. Rich and nice balance. On the palate it's also rich, with powerful berry fruit supported by graphite shaving bitterness and clean sweet tannins that flow into a fairly long graphite laced finish with an alcoholic underpinning due in part to the warmth of the day I tasted it. Pleasant, deft, and will work very well with grilled meats or light roasts, and also has good aging potential. In short, a wine for collectors -- only 5,000 bottles were made, and a wine that should you come across you should snap up. Fattoria Ambra Barco Reale di Carmignano DOC 2010 Lively cherry ruby with black reflections. The bouquet is brambly, with lively berry fruit supported by some greenish accents and some graphite shaving bitterness that balance nicely. On the palate it's bright, with lively sour cherry fruit supported by dusky graphite shaving bitterness and by tannins that have a splintery burr and flow into a clean rather green sour berry fruit finish. Pleasant in a light aggressive key, and will drink well with simple grilled meats or light stews, and will also work nicely with fried meats and vegetables. Classic quaffing wine. Deep cherry with black reflections. The bouquet is brooding, with berry fruit supported by hints of wet paper and bramble; it's not as clean as I might have liked. On the palate it's ample, with fairly rich sour cherry fruit supported by sour berry fruit acidity and tannins that are fairly dry and flow into a dry tannic finish. It's a wine that will work well with fattier meats that need something to clear the palate between bites. Grilled sausages, for example. Fattoria Ambra Vigne Alte Montalbiolo Carmignano Riserva DOCG 2008 Deep black cherry with black reflections and cherry rim. The bouquet is moderately intense, with graphite shavings and some spice mingled with savory notes and slight wet earth; there's not much fruit and it revolves more around minerality than fruit. The palate reflects the nose, with considerable minerality and tertiary flavors including wet earth and pepper, and also some cedar, though it plays a secondary role, and flows into a fairly long bitter finish. If you like the style it will work well with hearty roasts or stews, for example wild boar, but if you prefer fruitier wines it won't work as well for you. Lively cherry ruby with black reflections and cherry rim. The bouquet is fairly intense in a rather rustic key, with balsamic accents mingled with sea salt and some animal notes, and holding it together some bell pepper vegetal accents. On the palate it's ample and smooth, with bright sour cherry fruit supported by bell pepper vegetal accents and savory notes, and also tannins that have a splintery burr to them, and flow into a clean savory finish. Pleasant in a bright savory key, and if you like the style, which is fairly traditional, you will enjoy it. Fattoria Ambra Vinsanto di Carmignano DOC 2004 Dusky amber with white rim. The bouquet is fairly intense, though not too complex, with dried apricot and some walnut skin mingled with alcohol; it gives an impression of being less sweet than some vinsanti. An impression belied on the palate; it's sweet, with fairly rich dried apricot fruit supported by brown sugar sweetness and some apricot acidity that carry together for a considerable distance, gradually fading into sweetish warmth. It's not as complex as some, and lacks the walnut skins one often finds, but does have a pleasing warmth and though I would have liked greater complexity, especially on the nose, does have something to say. Fattoria di Bacchereto Terre a Mano Carmignano DOCG 2009 Deep black cherry with black reflections and cherry rim. The bouquet is bright, with lively cherry and forest berry fruit, in particular black currant fruit, and some brambles with some hints of gum Arabic. Quite young. On the palate it's smooth, with moderately intense dusky berry fruit supported by acidity and hints of scalded milk, and by tannins that are smooth and have a slight cedary overlay that almost brings butterscotch to mind, and flows into a dusky finish. It's fairly aggressive, and will work well with succulent meats, red especially, off the grill or from the oven. Deep black cherry ruby with black reflections and cherry rim. The bouquet is fairly intense, with India ink and brambly berry fruit largely overshadowed by pencil shavings and graphite bitterness, and some gum Arabic as well. I'd have liked richer fruit. On the palate it's fairly light, with decidedly brambly fruit supported by tannins that have savory accents and hints of hazelnut, and flow into a rather brambly finish. It's a scrappy wine, and if you like the style you will enjoy it with grilled meats and similar. I'd have liked a little more richness and roundness to the fruit. Podere Allocco Barco Reale di Carmignano DOC 2009 Lively black almandine with black reflections and cherry rim. The bouquet is fairly bright, with vegetal laced berry fruit supported by sour cherry acidity and spice, also by some sweetish greenish accents that bring yellow peaches to mind, and as it opens the peaches become stronger. On the palate it's medium bodied and soft, with fairly rich dusky cherry fruit supported by moderate berry fruit acidity and by tannins that have some peppery vegetal accents, though less than many, and flow into a fairly long berry fruit finish with vegetal overly and slight pepperiness. Pleasant in a softer, less aggressive key than many, and if you like this better than the qualities of the more aggressive wines, you will enjoy it. Deep ruby with black reflections and cherry rim. The bouquet is a bit more rustic than some, with animal hair and some horse lather mingled with sour berry fruit and some menthol as well. On the palate it's medium bodied, with bright sour berry fruit supported by sour cherry acidity and tannins that are smooth and fairly dry, flowing into a sour brambly finish. It's old style, and if you like this sort of traditional wine you will enjoy it and find it worth seeking out. If you prefer wines with richer riper fruit and rounder tannins it will work less well for you. Podere Il Sassolo Barco Reale di Carmignano DOC 2010 Lively cherry ruby with black reflections. The bouquet is tart, with sour cherry fruit supported by some orange acidity and hints of dried orange peel; there are also greenish accents and some alcohol. On the palate it's light, with bright sour cherry fruit supported by sour berry fruit acidity and tannins that have a warm rather splintery burr and flow into a clean slightly splintery finish with some greenish sour cherry accents. Pleasant, and very much a food wine that will work well with pasta dishes, in particular meat sauces light meats, and fried foods. If you like the style, which is fairly aggressive, you will enjoy it. Podere il Sassolo Carmignano DOCG 2009 Deep black cherry ruby with black reflections and cherry rim. The bouquet is moderately intense, with some berry fruit and quite a bit of cedar with some brambly greenish accents thrown in. It's coming together, but I'd have liked more fruit. On the palate it's ample and well polished, making for a wine that's quite smooth, and flows into a fairly savory finish What's missing is the fruit, which seems to be hiding under the tannins and lets savory notes and tannins carry the show. Piaggia Piaggia Il Sasso Carmignano DOCG 2009 Deep black cherry ruby with cherry rim; it's darker than most. The bouquet is fairly intense, with berry fruit and some green leather mingled with vegetal accents and moderately intense brambly acidity. The overall effect is dark and rather brooding. On the palate it's medium bodied, with moderately intense tannins and moderate rather dusky fruit that is supported by some brambly, savory acidity, and flows into a rather bitter finish. I'd have liked greater richness of fruit, though the savory accents are pleasant and will work well with succulent meats. Impenetrable pyrope with black reflections, The bouquet is rich, giving an impression of smooth polish, with berry fruit supported by greenish bell pepper accents and some menthol, with a fair amount of alcohol as well. Rather international in feel. On the palate it's medium bodied and deft, with fairly rich pepper-laced berry fruit supported by graphite bitterness and tannins that are smooth and rather savory, and flow into a clean bitter finish. It shows considerable polish and will become graceful with time; if you like the style, which is more international, you will enjoy it considerably. To be honest, it didn't seem a barrel sample, but we asked and were assured it was. Deep pyrope with cherry rim; it's poured ink. The bouquet is surprisingly fresh, with very ripe cherry plum fruit supported by jammy accents and pleasant spice. Quite international in feel. On the palate it's full and rich, with powerful plum fruit supported by smooth sweet tannins and moderate acidity that flow into a clean bright fruit laced finish. It's elegant in an international key, and will drink well with roasts or stews, including meats that are fairly dry, pot roasts, for example. Much more fruit driven than many, and thus in a different key. If you are traditionally minded it won't work for you, but if you like smooth rich fruit driven wines you will like it. Tenuta Le Farnete Barco Reale di Carmignano DOC 2010 Deep black almandine with black reflections and cherry rim. The bouquet is intense and quite bitter, with a rush of graphite shavings accompanied by some bell pepper and a fair amount of alcohol. The cabernet emerges strongly. On the palate it's bright, with lively greenish vegetal and bell pepper accents supported by graphite shaving bitterness and by tannins that have greenish vegetal notes and flow into a clean vegetal finish with underlying graphite bitterness. If you like the style, which is towards vegetal cabernet, you will enjoy it considerably and it will work well with simple foods. Black cherry ruby with black reflections and cherry rim. The bouquet is moderately intense, with smoky berry fruit supported by some savory greenish accents and moderate alcohol. On the palate it's light and fairly light, with lively peppery vegetal accents supported by spice and spur cherry fruit that flow into a clean rather bright vegetal finish. Direct, and fairly aggressive, and will drink well with simple grilled meats or light stews, also fried meats and vegetables. Tenuta Le Farnete Carmignano DOCG 2009 Deep black cherry ruby with black reflections and cherry rim. The bouquet is fairly intense, with brambly berry fruit laced with heather and some graphite and balsamic accents; there's also a dusky sourness to it. On the palate it's smooth, and again rather dusky, there's not much fruit, but rather savory cedary bitterness, supported by savory notes and tannins that are rather cedary, and flow into a savory finish. It brings to mind those prune jams that are cooked down considerably and have aged for a couple of years before they're opened. Tenuta le Farnete Carmignano DOCG 2008 Deep black cherry ruby with black reflections and cherry rim. The bouquet is brambly, with dusky cedar and some greenish accents, and a fair amount of alcohol too, but not that much fruit. On the palate it's brighter than I expected, with moderately intense sour berry fruit supported by moderate brambly acidity and tannins that have considerable graphite bitterness to them, and flow into a rather bitter finish that's fairly long. It's quite young, but does display a pleasing grace, though you have to like the style, which is not fruit forward. If you do like the style you will need -- not want -- a second bottle, because it goes down quite easily. Deep black cherry ruby with black reflections. The bouquet is fairly intense, with berry fruit and bell pepper supported by some sea salt; with swishing the pepper increases and gains grilled overtones. On the palate it's medium bodied, with fairly rich bell pepper laced fruit supported by savory notes and tannins that are dry and spicy, and flow into a dry spicy finish with peppery accents. The cabernet is very apparent, and if you like the style you will enjoy it, and it will work well with simple grilled meats or light stews. I found it a bit extreme, though in a positive way. Tenuta Le Farnete Carmignano Riserva DOCG 2008 Fairly deep black cherry with some hints of almandine. The bouquet is muted, though swishing brings up some dusky aromas of wet earth and vegetal accents -- it's clearly at the outset of its development and has a ways to go. On the palate it's savory, with fairly bright sour berry fruit supported by cedar laced savory accents and warmth, and flows into a fairly long savory finish. It's traditional in feel, and needs time, but if you like the style it may well prove rewarding with time. Tenuta Le Farnete Carmignano Riserva DOCG 2007 Deep black cherry with black reflections and almandine in the rim. The bouquet is savory, with some cedar and quite a bit of sea salt mingled with warmth. On the palate it's pleasant, with fairly rich cherry fruit supported by savory notes and spice, and flowing into a clean bright savory finish. Pleasant in a traditional key, and will drink well with grilled meats or light stews. Tenuta le Farnete Rosso Passito IGT Toscana 2010 This is an Aleatico passito, and is deep pyrope with cherry ruby rim. The bouquet is rich and sweet, with the candied fruit and vegetal accents typical of Aleatico mingled with some menthol and pleasant acidity that has a sour lemon cast to it. Nice balance and complexity. On the palate it's full and sweet, with bright chewy red berry fruit supported by warmth and roundness due to both fruit and sweetness, while there is pleasant ripe raspberry cherry acidity to keep it from being cloying, and it flows into a clean bright rather tart berry fruit finish supported by lasting sweetness. A nice Aleatico that will be quite pleasant with friends either around a fire in the winter moths (or with cheese), or on a patio in summer as the heat fades and the stars come out. Pratesi Pratesi Locorosso Barco Reale di Carmignano DOC 2010 Deep black cherry ruby with black reflections and cherry rim. The bouquet is fairly rich, with berry fruit supported by alcohol and some berry fruit acidity, with some mentholated spice as well. On the palate it's fairly light, with bright lively sour berry fruit supported by lively sour cherry acidity and some vegetal accents, and also by tannins that have a warm vegetal overlay and flow into a clean rather splintery berry fruit finish. A good rather brash, direct food wine that will work well with simple grilled or fried meats. Deep pyrope ruby with violet rim. Looks young. The bouquet is fairly rich, with berry fruit supported by rustic stable straw notes supported by hints of gum Arabic and -- something I hadn't encountered in a very long time -- modeling glue. On the palate it's moderately intense and quite savory, with slight sour cherry fruit that allows the tannins and the savory notes to carry the show. I would have liked more fruit than I found. Deep cherry ruby; it's close to poured ink. The bouquet is fairly intense, with some berry fruit supported by vegetal accents, cedar laced spice, and some savory notes, with something added that is rather sunny. On the palate it's fairly rich, with bright cherry fruit supported by savory notes and some spice, and flowing into a clean savory finish. I would have expected a little more richness from a Riserva. Pratesi Carmione IGT Toscana 2008 Deep pigeon blood ruby with black reflections; it's close to poured ink. The bouquet is muted, though swishing brings up some savory berry fruit laced with vegetal accents and spice. Deft, but needs time. On the palate it's less bright than I had hoped, with moderately intense berry fruit supported by strong savory tannins that flow into a decidedly savory finish. Tannins and savory notes overshadow the fruit, and they are not something that will fade with time. Castelvecchio Castelvecchio Vin Ruspo DOC 2010 Rosy salmon with brilliant reflections and onionskin rim. The bouquet is fresh, with moderately intense berry fruit supported by some brambles, though not as much as in sample 1, and some pleasant hay and herbal accents. On the palate it's bright, with lively sour berry fruit supported by sour cherry and raspberry acidity, and by some tannins that are slight and have a slight burr to them, and flow into a bright sour cherry finish with acidity and a very slight tannic underpinning. Pleasant, and will drink well as an aperitif or with cold cuts, and also be a nice bet at a picnic or cookout. Cherry ruby with black reflections and cherry rim. The bouquet is moderately intense, with berry fruit supported by greenish vegetal accents and spice, and also some brambly notes and spice. On the palate it's fairly light, with bright sour cherry fruit supported by brambly tannins and lively sour cherry acidity that flow into a clean greenish sour berry fruit finish. Pleasant in a rather brash aggressive key, and will drink well with simple grilled meats or other rich foods, and also has the acidity necessary to work well with fried meats and vegetables. If you like the style you will enjoy it. Castelvecchio Carmignano DOCG 2009 Deep black cherry ruby with black reflections and cherry rim. The bouquet is fairly rich, with vinous brambly accents supported by sour berry fruit and some spice. Nice depth and quite young. On the palate it's medium bodied and quite smooth, with fairly rich cherry fruit supported by moderate acidity and smooth tannins that have a slight savory cedar laced burr, and flow into a clean rather dry finish. It's pleasant in a smooth fairly well polished key, and though it needs another year or two to get its bearings will be pleasant in a fairly ethereal key. Deep black cherry ruby with cherry rim. The nose is moderately intense, opening to reveal menthol-laced berry fruit with some vegetal accents. Pleasant though not too intense. On the palate it's ample, with soft sour cherry fruit supported by brambly acidity and tannins that have a graphite laced bitter cedar overlay and are also fairly dry, and flow into a dry finish. I had expected more from the palate, which is weaker and less directional than I would have expected from the nose. Colline San Biagio Sancti Blasii Carmignano DOCG 2008 Deep black cherry ruby with black reflections and cherry rim. The bouquet is fairly intense, with berry fruit and spice mingled with hints of camphor and balsam; the effect is rather exotic. On the palate it's medium bodied, with bright cherry fruit supported by brambly berry fruit acidity and by tannins that are rather dry and cedar laced, and flow into a warm dry tannic finish. It's not a wine to drink by the glass far from the table, but will drink well with more succulent foods that beg something to clear the palate between bites, and if you like the style, which is fairly traditional, you will enjoy it. Tenuta La Borriana Barco Reale di Carmignano DOC 2008 Lively cherry ruby with black reflections and cherry rim. The bouquet is moderately intense, with vegetal accents and some spice mingled with ripe berry fruit and some berry fruit acidity; with respect to some of the other Barco Reale wines it is less brambly. On the palate it's light, with bright sour cherry fruit supported by sour berry fruit acidity and tannins that have a slight burr to them and flow into a long warm sour berry fruit finish. It's less aggressive than many, with fruit that is more fruit and less vegetal; if you like the style it will drink nicely with simple meats and vegetables, and is pleasingly direct in a fairly aggressive key. Deep black cherry ruby with black reflections. The bouquet is fairly intense, with berry fruit laced with leather and some horse lather, and also some vegetal accents. With spice and slight hints of gum Arabic. On the palate it's fairly rich, with sour cherry fruit supported by savory notes that flow into a rather savory berry fruit finish with dry tannic underpinning. I found it a touch dry, though this dryness will allow it to work well with succulent meats. Deep black almandine with black reflections and cherry rim; it's close to poured ink. The bouquet is fairly rich, with some underbrush and cherry fruit supported by some jammy accents and spice, and by slight cedar as well. On the palate it's ample, with elegant forest berry fruit supported by deft acidity and smooth sweet tannins that flow into a clean fairly rich plum finish with some prune acidity. Elegant in an international key, and will drink nicely with roasts or stews. It's also quite young, and will do interesting things with time. Marchesi Pancrazi Pinot Nero Villa di Bagnolo IGT Toscana 2009 Almandine ruby with black reflections and almandine in the rim. The bouquet is moderately intense, with berry fruit supported by slight acidity and lacquer, and also some savory notes. On the palate it's bright, with lively sour cherry fruit supported by smooth savory tannins that flow into a fairly long bright savory finish. Elegant and graceful, displaying considerable finesse, and will drink quite well with grilled meats or stews, and also has the capacity to age well for 5-8 years at least. 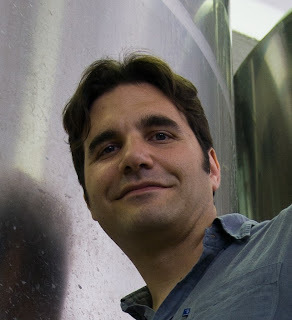 This article cannot but begin with apologies: Apologies to Leonardo di Vincenzo, the brewmaster of the La Birra del Borgo Brewery, the co-protagonist of this post who should appear at the top. 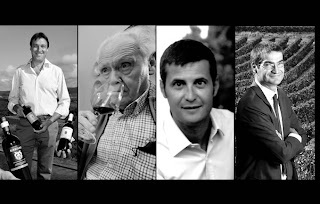 However, since space is at a premium (for me as I can only include one picture in my posts, though not for my IGP Friends, who will I hope be freer with their images), I hope he will forgive me if I place, beside the faces of the Tommaso and Federico Marocchesi Marzi and their winemaker, Stefano Porcinai, the face of Giulio Gambelli, the legendary "Bicchierino" who has followed the estate's wines for decades, giving them character and style. And I really would like to know what the great Giulio thinks of L'Equilibrista, a beer from Sangiovese must (must from Bibbiano of course) that they began to make in 2009, after Tommaso Marocchesi and Leonardo Di Vincenzo thought it up, almost as a lark, at Vinitaly. It is true that the Marrocchesi marzi family has been making wine in the hills of Castellina in Chianti for five generations and almost 150 years. A century and a half, given the times, would be equivalent to a continuity of many centuries in times past. It was therefore inevitable that the owners should have come up with something original. Thus, alongside Invigna, the annual wine summerfest the brothers organize in the vineyards, came beer, to the grea t delight of the invited. An enticing product, I'll admit, in many ways: how it was conceived, the technique, its taste, its color. It's the result of a 50-50 blend of fresh Sangiovese must from Chianti and Duchessa wort; Duchessa being the farro based beer from the brewery in Borgorose, which ferments with wine yeasts, and referments in bottle with Champagne yeasts. After a year in the cellars, the brewmaster disgorges it, and adds liqueur d'expedition made from distilled Duchessa. Thus is born L'Equilibrista, unfiltered and unpasteurized. A beer that tastes like wine, or a wine that tastes like beer. That goes down like beer, but has the alcohol content (10.5%) and body of a wine. In short, a great drink. You swish it in the glass, looking for the term for the color, and come up short. Red gold tending toward orange, vinous aspect, moderate compact head. No getting around it, it brings must to mind. The nose is striking thanks to its complexity and at the same time its freshness, there's farro, barley, toasted accents, and the unmistakable aroma of wine, and finally a rich of yeasts and bread crusts, just like Champagne. And that odd vinousness comes forth on the palate too, with underlying acidity that binds a long complex structure supported by an alcoholic spine that makes it noteworthy, suitable for substantial dishes. Even though you can simply sip it on its own, enjoying the sun setting over the hills of Chianti, and it will be perfect. It's odd that this birragne (beer-Champagne, my term) comes in part from, and he'll be the first to admit it, a modest beer drinker such as Tommaso Marrocchesi, and a winery that has nothing of the "brewery" about it, with solid straight forward wines that are invariably elegant, untouched by the vagaries of fashion, and traditional without being boring. The total opposite of the wildness writers associate with beer. Perhaps the name, L'Equilibrista, wasn't by chance. I confess, before this Vinitaly I had never heard of Roberto Ceraudo, nor tasted his wines. But I did get a note suggesting I visit his stand, and it piqued my interest enough that I did. And am quite glad that I did, because the wines, all from organically grown grapes, most of which are indigenous to Calabria, are well worthy of note. At Vinitaly, when the stand is busy there is little occasion to talk, so I simply swished the wines and took notes. But if I go to Calabria I will make plans to visit the winery. This is Greco Bianco and Mantonico. It's brilliant brassy gold with gold reflections and white rim. The bouquet is intense, with fairly rich loquat fruit supported by moderate acidity and some greenish accents that add depth. Nice depth and impressive for a just-bottled wine. On the palate it's full and rich, with fairly sweet (for a dry wine) loquat fruit supported by warm mineral acidity and slight sweetness that flows into a fairly long mineral finish. Pleasant and quite approachable, and will drink nicely with egg based dishes such as frittate in summer, and also simple fish or white meats. If you like really crisp wines it won't work as well for you, but if you like slightly softer more languid whites with a touch of sun to them you will enjoy it. This is Pecorella in purezza; it's an indigenous vine that they have reestablished, recovering it from wild vines by grafting it onto rootstock. The etymology of the name is uncertain but it may due to the fact that sheep love the bunches and will seek them out, much the way they seek out Pecorino in the Abruzzo. It's bright brassy gold with brassy reflections and white rim. The bouquet is fairly rich, with greenish herbal accents and some spice mingled with sweetness and some savory notes and slight almond blossoms. Herbal accents too. Nice. On the palate it's fairly rich, with moderately intense sour grapefruit fruit supported by savory minerality and some dusky overtones that flow into a clean rather bitter finish with some grapefruit overtones. Pleasant, and will drink quite well with grilled or roasted fish, and will also age nicely for 2-3 years at least. This is a Chardonnay that spends several months in small wood, a mix of new and year-old, after the primary fermentation -- it undergoes malolactic in wood. It's brilliant brassy gold with greenish highlights and brassy reflections. The bouquet is intense, with considerable butterscotch supported by sweetness and honeysuckle, and by slight savory accents. On the palate it's ample and rich, with bright lemony fruit that has some orange accents and an underpinning of butterscotch that flows into a long warm berry citric finish. Graceful, and a fine expression of Chardonnay that has taken well to the barrel but isn't at all overripe, and displays considerable depth as well. It will work very well with grilled or roasted fish, and would also be nice with delicate white meats, while I could see it working well with oriental dishes too, including curries. The color of the label is important; this is aged only in steel. It's Gaglioppo; Graya means woman in the local argot, and this wine is dedicated to Susi, Roberto's daughter. Pale pink with brilliant pink reflections and white rim. The bouquet is fairly bright, with savory notes and some sour raspberry fruit supported by pleasant floral accents. On the palate it's bright, with rich fairly sweet raspberry fruit supported by minerality and some acidity, and by pleasant savory accents that emerge in the finish. Quite welcoming, and will be a lark of a summer wine, and go very fast. Worth seeking out. This is again Gaglioppo, which spends 4 months in barriques. It's pale ruby with brilliant ruby reflections and white rim. The bouquet is deft though a bit closed -- just bottled -- with raspberry fruit that has more depth than that of the copper label, supported by some greenish accents and slight hints of vanilla and savory notes. On the palate it's fuller than the copper label, with fairly rich raspberry fruit supported by moderate acidity and by tannins that are smooth and as one might expect full for a Rosato, with a pleasant rosato acidity underpinning, and it flows into a clean fresh finish with pleasant acidity. It's the copper label's older sister, and a bit more powerful; which you prefer will be a matter of taste. This is a Gaglioppo that spends 12 months in tonneaux. It's brick ruby with dusky brick ruby rim. The bouquet is intense, with balsamic red berry fruit supported by dusky greenish accents and plasant mineral spice. There's something haunting to it. On the palate it's ample and smooth, with fairly rich balsamic sour berry fruit supported by mineral acidity and by tannins that are ample and smooth with some burnt leather accents, and flow into a fairly long balsamic finish. It's pleasant in a rich key, and though it does require a change of pace if one is used to French varietals, it's quite pleasant, and will drink very well with roasts or stews. Worth seeking out. This is a 50-50 blend of Gaglioppo and Cabernet Sauvignon, and spends 12 months in barriques. It's deep brick ruby with some almandine in the rim. The bouquet is intense, with berry fruit laced with green bell pepper and balsamic accents supported by a fair amount of alcohol, some spice, and a fair amount of sea salt, with some underlying graphite shavings as well. On the palate it's rich and quite smooth, with powerful cherry fruit supported by mineral acidity and smooth sweet tannins that have a fairly bright bark-laced burr to them, and flow into a clean mineral tannic finish. Quite elegant, and if you're not used to Gaglioppo is much more approachable than the Gaglioppo wine; it will work quite well with grilled meats or roasts, and also has considerable aging capacity. Here the Gaglioppo is 60%; the wine is deep brick almandine with some almandine and hints of Moroccan leather in the rim. The bouquet is rich, with powerful balsam laced berry fruit supported by vegetal accents and pleasing slightly candied prune fruit. Nice depth and richness in a (for me, with my Tuscan reference points) rather exotic key. On the palate it's full and quite smooth, with rich prune cherry fruit that has some balsamic accents whose interaction with the fruit brings cocoa to mind, and smooth sweet tannins that flow into a clean fairly rich berry fruit finish with some sweetish balsamic accents. Very pleasant, and will drink well with grilled meats or hearty stews. I found it a bit richer and more interesting than the 2006. This is a passito made from Magliocco, harvested in early September and allowed to dry on mats and then put into caratelli for a number of years. It's tawny walnut with slight greenish hints at the rim. The bouquet is interesting, with sweetness mingled with brown sugar and spice, and some dried orange peel and also warmth and caramel. And I could go on; there's quite a bit happening. On the palate it's full and sweet with elegant date fruit supported by lively acidity and some dried figs, with some walnut skin bitterness too, and it flows into a long sweet finish that gains definition from walnut skin bitterness and acidity. Very pleasant, and it is a wine that you should definitely think about and seek out if you like Vinsanto; it is clearly different but displays many affinities with Vinanto and has more in common with it than with many other passiti.